Sept 11: Very Chilly Next Week, First Frost? – I have ended the poll about the quality of my Hurricane Earl coverage. If you feel anything needs to be improved, feel free to post your comments on this post or send me an email. Your comments and suggestions are appreciated and will be taken into consideration with future storm coverages. – The 5-Day Forecast has been updated for the area tonight. After a chilly morning, with high temperatures ranging from the mid 40s inland to the mid-upper 50s in NYC, today brought more sunshine to the area, with high temperatures in the mid to upper 70s inland and the upper 70s to lower 80s in the immediate NYC area. The cool air mass is now moving out of the area ahead of a low pressure that should bring the first rain in over 15 days to the area, but a strong cool air mass will follow, that will potentially bring the fall’s first frost and freeze for the interior Northeast. Tomorrow will be a cloudy day, with an onshore SE wind expected. High temperatures will be in the upper 60s to lower 70s across the area, with the warmest temperatures in NYC. Looking at the rest of the region, the Northeast will see highs in the 60s due to the cloud cover, with Maryland into Virginia in the lower to mid 70s with a few upper 70s possible. Meanwhile, a low pressure associated with the remnants of Tropical Storm Hermine will move into the area from the west. No heavy rain is expected from this storm, but it is still likely to rain. The rain will start to move into the area between 10 AM and 12 PM, and will stay until the late overnight hours. Generally light rain is expected, though locally moderate showers are also likely. By the time that the rain ends, a total of at least 1/4 inch is expected, with locally higher amounts up to 1/2 inch. By Monday, the storm will be east of the area, but there will still be showers across the Northeast, with an isolated shower possible for the area with mostly cloudy skies and highs in the mid 70s to lower 80s. On Tuesday, the cold air mass will start to spread into the area, with high temperatures cooling down into the lower to mid 70s with a few upper 70s possible for the immediate NYC area, with partly cloudy skies. Wednesday will be the coldest day of this cool spell. With 850 mb temperatures only between 2c and 4c, and some cloud cover potentially limiting temperatures, the high temperature will only reach the lower to mid 60s inland and the mid to upper 60s for the rest of the area, which is below the average high temperature. There will be more cloud cover further north, into the Northeast, where scattered showers are expected. On Wednesday night, with clearing skies, low temperatures will drop into the lower 40s and potentially upper 30s inland, mid to locally upper 40s for the N/W suburbs of NYC and S CT, upper 40s to lower 50s in Long Island, and lower 50s in NYC. 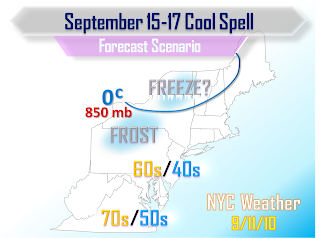 The interior Northeast is likely to see the first frost and freeze of the fall, however it is uncertain how far the frost expands. At this time, frost is unlikely for the NW parts of the area, however should the models trend colder, that solution may become possible. Thursday will be slightly warmer, with highs in the mid 60s to lower 70s across the area, due to a storm approaching from the west, with increasing cloud cover. A strong storm is likely to move into the Northeast on Friday, bringing heavy rain to that region and briefly drawing in a warmer air mass into the area ahead of a cold front. The cold front, however, will bring little or no rain, with a cool airmass coming into the area for Saturday and Sunday with dry conditions and chilly temperatures but not as chilly as Wednesday’s cool spell will be. By Monday, a low pressure is expected to form in the Midwest, and by then, with a +NAO returning, the next warm up will likely return into the area. Tropical Storm Igor, currently in the eastern Atlantic, is steadily intensifying, and will become a hurricane very shortly. Igor has a supportive environment, and will slowly intensify over the next few days, but afterwards with a favorable environment, and with the model forecasts, Igor is expected to become a Category 4 by mid-late this week. About its track, I am currently thinking that for the short range, it could be slightly south of the model forecasts, though it should stay NE of the Leeward Islands. For the longer range, there is uncertainty, but I am thinking Igor could stay away from the East Coast due to a high pressure over the area at that time. With this scenario, however, Bermuda would need to closely follow Igor, as a lot of models showing this have a direct hit for Bermuda. Stay tuned for more details on Igor, in case it trends closer or away from the East Coast. There are currently two tropical invests, the first in the eastern Caribbean and the other in the far eastern Atlantic Ocean. They have a favorable environment nearby, and are likely to develop into tropical storms within the next few days. The low pressure in the Caribbean is likely to move towards the Yucatan Peninsula, then towards Mexico south of Texas. More updates on these invests will come over the next few days.